1 What Is Water Softening And How Does It Work? 2 Are Water Softener Shower Heads Efficient? 3 Why Can’t Shower Heads Soften Hard Water? 4 What Can You Use To Soften Your Water? 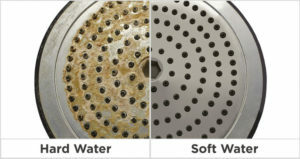 Using a water softener shower head should make your skin and hair look better, right? So why aren’t you capable of noticing any difference after using such a water softener? Well, the truth is, you were lied to. You were lied to when you were told that a shower head can work as a softener as well. That’s just not possible. In the following article, we explain how water softeners work, and we reveal why a shower head cannot work as a softener, even if it’s marketed as one. In the second part of the article, we take a look at some of the water softening solutions that actually work, and we examine the benefits of using soft water while showering. Are you looking for a reliable way of filtering shower water? Check out our list of the top shower water filters for hard water available today! What Is Water Softening And How Does It Work? 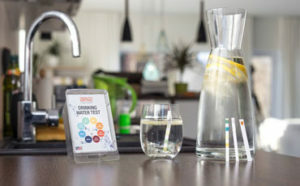 Hard water has a high mineral content, and it’s especially rich in large amounts of calcium and magnesium carbonates, but also ferrous iron. The problem with hard water is that the calcium and magnesium ions interact with the fatty acids in the soaps, making them a gelatinous curd. Because the soap is less efficient, you have to use more of it to wash. Not only will this curd make the soaps more inefficient, but it will also make your bathroom look uncared for. When the hard water splashes the walls of your bathroom, some of the minerals in the water drops will create scale build-ups. Due to the scale built-ups, some of the water pipes can also be blocked. 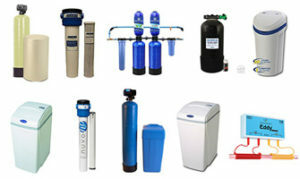 Water softening is the process through which the calcium, magnesium, and other metal cations in the water are removed. This is done by changing the calcium and magnesium ions’ charges. While this might seem complicated at a first glance, it’s really not. So, the calcium and magnesium ions in the water carry positive charges. The water softener pushes the water through a tank filled with negatively charged beads. As the water passes through the tank, the positive calcium and magnesium ions will cling to the beads instead of floating through the water. The magnesium and calcium ions cling to the beads and displace the sodium ions. The brine tank is refilled. The process is now ready to start again. Are Water Softener Shower Heads Efficient? 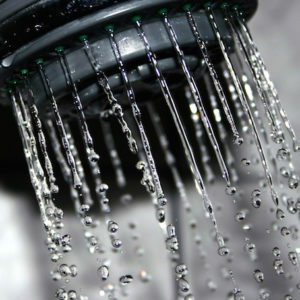 No, water softener shower heads cannot possibly work, and here’s why. 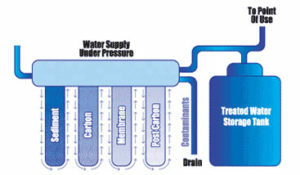 As you could see, water softening is a very complex chemical process. And the most important part of that chemical process is the ion exchange between the sodium-filled beads and the calcium and magnesium. Without this exchange, the process wouldn’t work. Now, this is a simple chemical exchange, but there are a lot of elements that come into play. The beads have to be charged with sodium, to start with. They can’t do that unless the sodium is constantly regenerated. And the sodium can only regenerate if the beads are immersed in a strong brine solution. Once they’re removed from the beads, the calcium and magnesium ions have to be flushed into a separate drain. Why Can’t Shower Heads Soften Hard Water? Simply put, there is not enough time for the water to be softened. 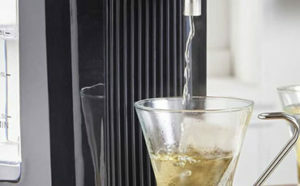 Water softening is a long-lasting process. Here’s how efficient water softeners do it. Water softeners use an automatic regenerating system. Some models use a computerized system that tracks how much water you use. When the system detects that enough water passed through the mineral tank and the beads are depleted, it will automatically trigger the regeneration sequence. During this sequence, some models will use a reserve resin tank to produce soft water. The models that don’t use a reserve resin tank won’t produce soft water during this time. Some water softeners use an electric timer to flush and recharge the beads on a regular schedule. During the regeneration process, the softeners don’t produce soft water. And other systems use a mechanical meter to determine how much water has passed through the system and start the regeneration sequence. These models might come with not one, but two mineral tanks, so they will soften the water at all times. As you can see, every efficient system goes through a regeneration sequence. Even if the shower head water softener would work at first, the beads they use would be charged with minerals in a short time, and without regeneration, they would be rendered useless. What Can You Use To Soften Your Water? Now that we explained why using shower head water filters is not a viable solution to getting soft water, let’s take a look at some of the water filtering solutions that are. for households. This system gradually eliminates the particles in the water, and the end result is a healthy and extremely clean tap water. 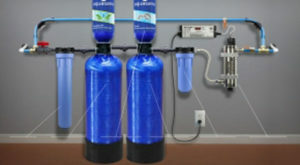 A reverse osmosis filtration system will push the water through multiple filter mediums until almost all the elements present in the water are removed from it. You can say that this filtration system purifies the water at a molecular level. The first line of defense the RO system uses is a prefilter. When the water passes through the prefilter, all the large particles that float through it will be removed. These particles include but are not limited to salts, scale, rust, and sediment. At this point, most of the calcium and magnesium are removed, so the water is softened. Some models even use an activated carbon filter to remove the chlorine and other dissolved particles that might be present in the water. The second filtration medium is the membrane. The membrane is covered in extremely small pores, and even the smallest contaminants are removed at this point. In fact, the pores are so small that not much will go through them except for the hydrogen and oxygen molecules that form the water. 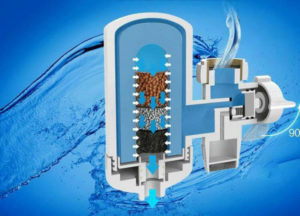 After the water passes through the membrane, it reaches the final stage of the filtration. During this stage, the water passes through an activated carbon filter that will eliminate the remaining organic compounds that might give the water a bad taste or smell. 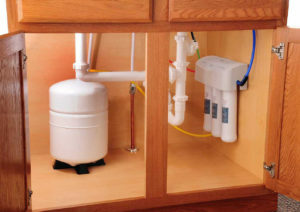 Using a reverse osmosis filtration system is a great way to soften your water and make it healthier at the same time. 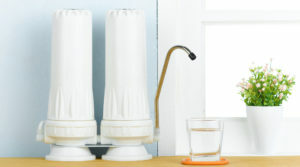 This filtration technique will remove almost all the contaminants in the water. Removes all the minerals in the water, including the healthy ones. Magnetic water conditioners are not exactly water softeners, but they can reduce the effects of the hard water. In fact, these might be exactly the units you should be looking for if your water source is not very hard. These units can be attached to the water line, and they produce a magnetic field. When the hard water passes through the magnetic field, the impurities and salts in the water will change their behavior. As a result, instead of sticking together and attaching them to the pipes and appliances in your home, the calcium and magnesium molecules will still be present in the water, but they will flow freely down the drain. Now, if your water source is very hard, the magnetic field produced by the conditioners will not be strong enough to change the behavior of every calcium and magnesium molecule, and you might not notice any difference when using a conditioner. On the other hand, if your water is not very hard, using a magnetic conditioner might be the cheapest solution to your water softening problem. Does not remove the calcium and magnesium from the water. Our bodies need these elements to stay healthy, so it’s important to find them in the water. A potassium chloride water softener will use potassium chloride instead of sodium to remove the calcium and magnesium in the water. Since this process doesn’t use sodium, the water is suitable for those who follow a low-sodium diet. Moreover, sodium waste can be harmful to the environment, so not using it is more eco-friendly. The potassium chloride water softener will use the same ion-exchange process normal softeners use to remove the hard water minerals. But instead of replacing the minerals with sodium, the beads will release potassium into the water. Potassium is necessary for a healthy life, but some medical conditions might restrict your access to it. If you suffer from diabetes, heart disease, or other chronic medical conditions, you should consult with your physician before drinking potassium-enriched water. Even though potassium chloride does not contain sodium, it’s still a salt. So what do you do if you want to soften your water but you don’t want to use any kind of salt? Well, you use a salt-free softener, of course. Salt-free water softeners work in a similar way to the magnetic conditioners we described above. 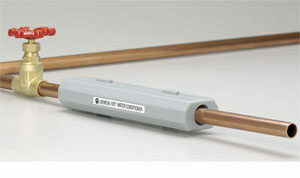 These systems are attached to your home’s main water line and they produce a wide range of frequencies. When the water passes through those frequencies, the crystal structures of the calcium and magnesium change. By changing their structure, these elements won’t tend to bind to one another, so they won’t make upscale. Thus, the water will move freely, and it won’t cause any build-ups. Even though the water won’t produce build-ups, that doesn’t mean that the calcium and magnesium ions won’t be present in it. So in a way, you can say that these systems don’t soften the water at all. However, the results will be present, and you won’t need to use so much soap to wash and your bathroom will look cleaner than ever before. Even though there are no efficient water softener shower heads, that doesn’t mean you shouldn’t use soft water when you shower. Here is a list of some of the benefits you’ll experience when showering in soft water. You’ll Use Less Soap – This might not seem like much, but showering in soft water can lower your expenses. Thanks to the reduced mineral content, the fatty acids in the soap will not cling to one another, so you will use less soap, shower gel, and shampoo to wash. Your Hair Will Look Better – The minerals in the water will not only cling to your shower, they will cling to you as well. As a result, your hair looks lifeless and dull even right after you wash it. If you use soft water to shower, your hair will look full of life and its color will be better. You might even be able to manage it more easily. Your Skin Will Look Better – When you wash using hard water, your skin tends to dry out quickly. Even right after you wash it, the skin might feel sticky. In some rare cases, using hard water to wash can lead to rashes or even eczema outbursts. 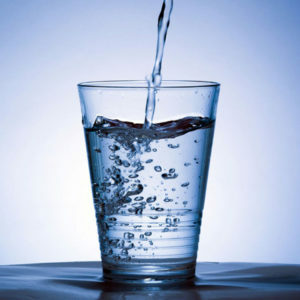 On the other hand, soft water will do a better job at hydrating your skin. Not only will your skin look better, but it will feel better as well. The natural oils on your skin will make it somewhat shiny and give it a healthier look. As you could see, the water softener shower head you bought was not the real deal. Even if the shower head seemed to work for a short amount of time, it cannot be functional in the long run because it has no means of recharging its resin beads, and it cannot flush the calcium and magnesium ions in a different drain. Luckily there are other water softening solutions you can use to make sure you shower using the best water possible.